They’re chunks of savings or lumps of money set aside for a certain purpose – retirement, say, or college, or a house or vacation. The term comes from a centuries-old practice in poultry farming. When a hen is unproductive or inconsistent, farmers strategically plant an egg – whether real or artificial – in the nest to try to stimulate the hen to lay eggs in that same spot. Think of it as a sort of behavioral conditioning – the way that going to a ballpark might make you hungry for a hot dog. Although the term nest egg is used a lot to refer broadly to a designated pot of money, consider it along the lines of those first couple of dollars a bartender puts in the tip jar to attract more money. And this shouldn’t be confused with “laying an egg,” which is a theater term for bombing at the box office. That’s probably more related to the shape of the egg, which looks like a big fat zero. In fact, the term “goose egg” means just that – nothing. 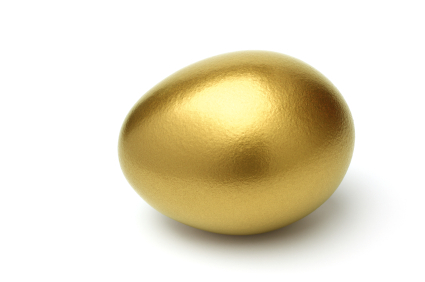 Wise investors know better than to put all their eggs in one basket. It’s just common sense to spread your risk, and it particularly applies to investment portfolios, which call for broadly diversified asset allocations.